Monica and I thoroughly enjoyed a Saturday at home; in the morning running errands around the city including grocery shopping at Superstore. 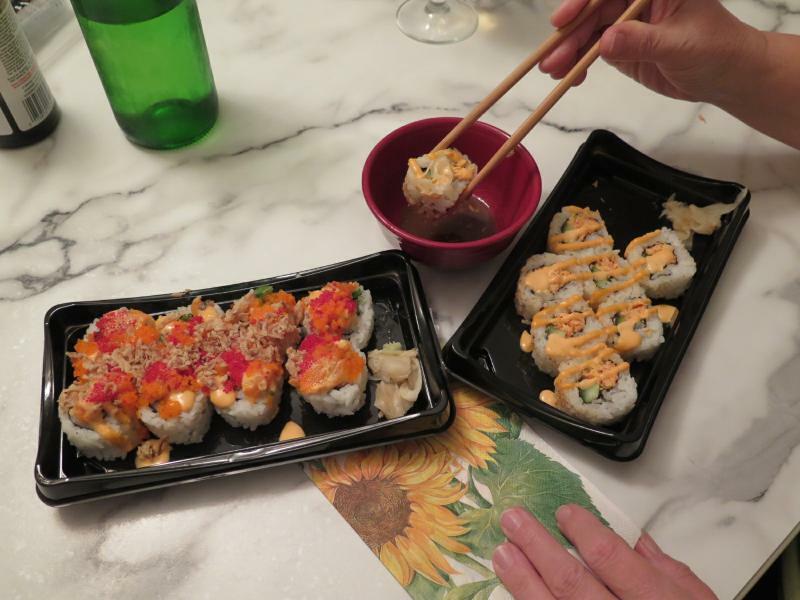 I couldn’t get past the sushi counter and was able to talk her into an easy dinner at home with a bottle of wine. Back at home, Monica made spaghetti sauce for family dinner night on Sunday while I ground glass for Christmas ornaments in the studio. Through the afternoon, Mon worked on photos for her scrapbook of our children’s lives (pause) and I sat in my comfy chair foiling glass. Total Contentment! Dinner was divine, of course, at 6:00 and so was the wine 😃. Just an average day at home you might think? Perhaps, but why then am I so thankful as if it rarely happens? It does… often.